Jojoba enriched with added vitamins and antioxidants for healthy, youthful looking skin. We like to call it the multi-vitamin for the skin. 100% NATURAL - suitable for all skin types. 100% natural ultimate jojoba youth potion smooths the appearance of wrinkles to visibly enhance skin texture and minimise the look of expression lines. Skin is deeply moisturised and rejuvenated making it radiant and youthful looking. 100% natural ultimate jojoba youth potion has a unique scent of the rare and precious linden blossom. 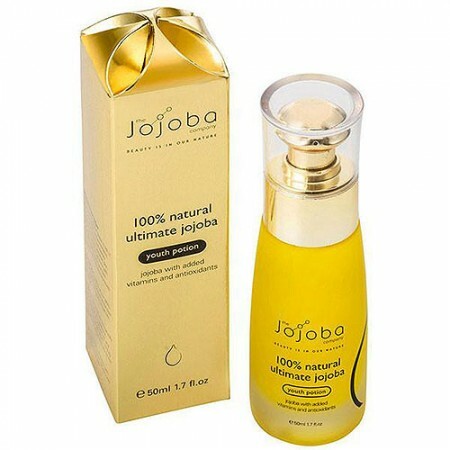 100% natural ultimate jojoba youth potion combines the qualities of 100% natural Australian jojoba with potent antioxidants, vitamins and essential fatty acids to include the full spectrum of vitamins (A, B, C, D, E & F) and essential fatty acids 3, 6 and 9 to promote healthy skin and enhance benefits to skin. 100% natural ultimate jojoba youth potion is infused with potent antioxidants including CoQ10 and vitamin E rich argan oil to provide protection to the skin against free radical damage which is a major cause of the appearance of aging skin; vitamin C rich baobab (native to Australia) and camellia oils to assist the stimulation of collagen production; vitamin A rich baobab and camellia oils to aid the skin renewal process along with meadowfoam to form a moisture barrier on the skin to prevent moisture loss and antibacterial manuka oil. Dispense 1-2 pumps onto fingertips and gently massage onto a cleansed face, neck and décolletage. Use morning and night for maximum benefit. Follow with a cream from The Jojoba Company range. Simmondsia Chinensis (Jojoba) Seed Oil*, Camellia Oleifera (Camellia) Seed Oil, Limnanthes Alba (Meadowfoam) Seed Oil, Adansonia Digitata (Baobab) Oil, Argania Spinosa (Argan) Kernel Oil, Ubiquinone (CoQ10), Tilia Cordata (Linden Blossom) Oil, Leptospermum Scoparium (Manuka) Branch/Leaf Oil. All reasonable efforts have been made to ensure that ingredient listings, product images and other information for products displayed on this website are up to date, accurate and complete. However, we still recommend that you please check the ingredient listings on a product before use. Please refer to our Terms & Conditions for more information.